A software VPN (virtual private network), also known as a 'remote access VPN', is an encrypted network connection between your own Internet-connected computer and a VDC local network, which bypasses (also called 'tunneling through') the firewall controls (firewall blocks, port forwarding, or load balancing) of a 'Local with Internet Gateway' network. The term software VPN is used to indicate that a private network is established based on open internet connections, through the use of encryption; other forms of VPN may use private physical networks. The basic VPN setup procedure for 'Local with Internet Gateway' networks is described in How to enable a software VPN connection to a VM. On your own computer, you will need to configure your VPN client software. Details will vary depending on your operating system and the client software that you have installed. 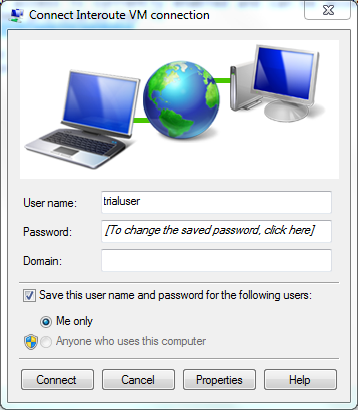 The setup is illustrated for the case of Windows 7 with its built-in VPN client. the internal IP Address for the virtual machine(s) you want to connect to. See How to enable a software VPN connection to a VM for more about the VDC setup. The VPN protocol used by VDC is 'Layer 2 Tunneling Protocol with IPSec', which is abbreviated to L2TP/IPSec. This may not be a default in your computer or client software and you may need to enable it. In the following, we use the VPN client software that is built-in to Windows 7. Other versions of Windows will be similar to this. Open the Network and Sharing Center (either click the Networks icon in the taskbar, or open the Control Panel in the Start Menu). Click Set up a new connection or network. This opens a new dialog. Click Connect to a workplace. Click Next. Click Use my Internet connection (VPN). 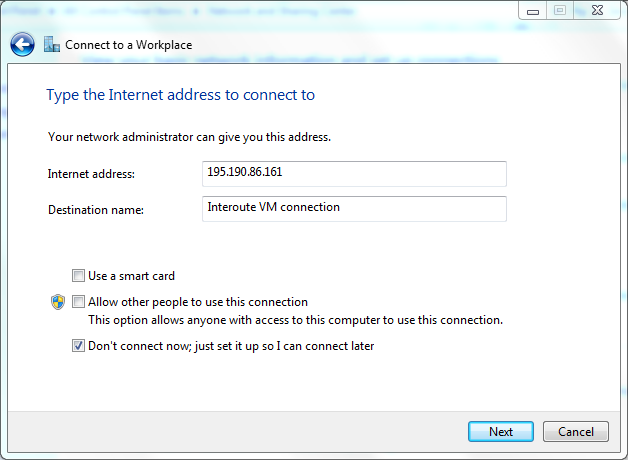 In the dialog, enter the Internet address (public IP address) of your 'Local with Internet Gateway' network. Set Destination name as something memorable for the name of this VPN connection. Click the Don't connect now … check box. 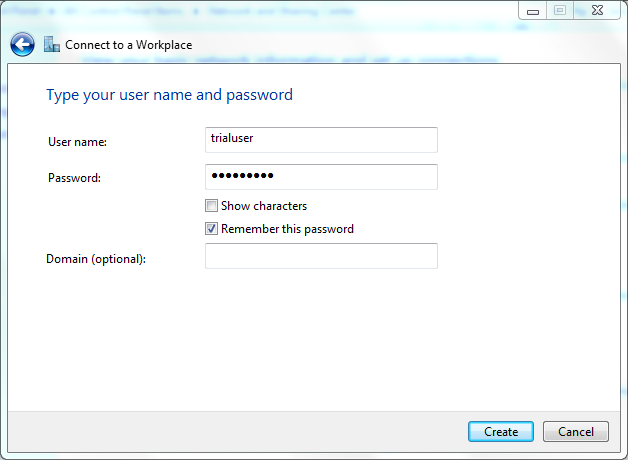 In the next dialog, type in your User name and Password. If you click Remember this password you won't need to type it again (be careful doing this on a computer that you share with others). Click Create. If successful, you will see a dialog with the message 'This connection is ready to use'. Do not click the 'Connect' button now, because another configuration step is required. Click Close. In the Network and Sharing Center, click Change adapter settings. You will see an adapter with the VPN destination name you entered above. Right-click this adapter and click Properties. In the Properties dialog, click the Security tab. 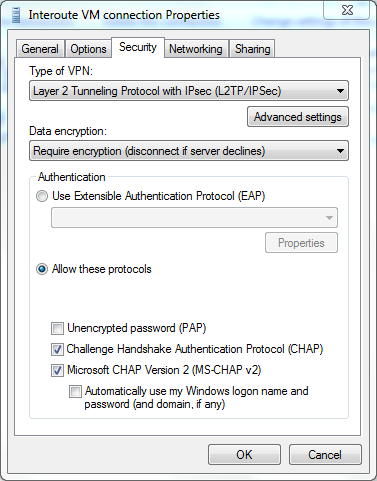 Under Type of VPN, select 'Layer 2 Tunneling Protocol with IPSec (L2TP/IPSec)' from the drop-down list. Click Advanced settings. 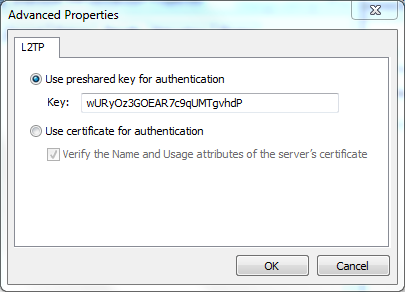 Click the Use preshared key for authentication button and enter the IPSec pre-shared key number in the text box. You should not need to change anything else. Click OK, and then again click OK.
That completes the initial configuration. You can close the Control Panel now. Click the Networks icon on the taskbar. You should see a new item under the heading 'Dial-up and VPN' with the VPN destination name that you entered above. Click this name. A Connect button will appear; click Connect to proceed. Alternatively, right-click on the VPN name. In the Connect… dialog, you may need to enter the VPN password if you did not check the 'Remember' option above. Click Connect. A dialog shows while the connection is setting up. This may take a few moments to complete. Now if you click the Networks icon you should see a new active connection and under the 'Dial-up and VPN' heading the status should be 'Connected'. To disconnect, click on the VPN name and click Disconnect. 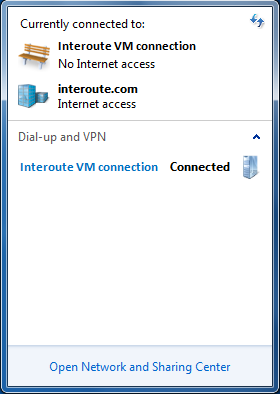 When the VPN is connected, your computer becomes part of the VDC internal network maintained by your 'Local with Internet Gateway' network. You are then able to connect to any of your VMs that are joined to that network, by using the internal (local) IP address for the VM. For example, to connect to a Linux VM for administration purposes, you should use an SSH application, such as the PuTTY telnet/SSH client for Windows, to open a secure shell connection. 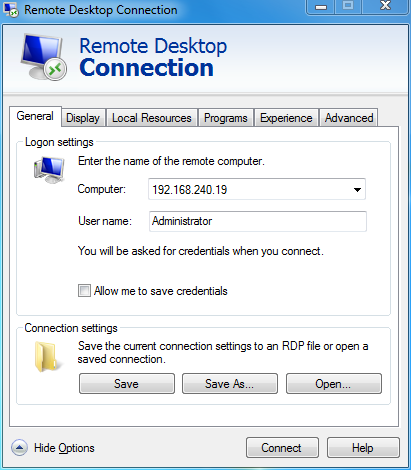 As is usual in Remote Desktop Connection, you may want to save these VPN-based connections for later use.